The Beef Market is shown as "H" on this 1788 map. "28" is the L-shaped alley called Market Square or Market Street that was closed to create City Hall Park. The Grand Modell of Charles Town (1680) reserved a civic square at the intersection of today's Broad and Meeting streets, a place for public buildings and a market. As the town grew, vendors erected stalls, and by 1739 a brick market building had been constructed on the large lot. A legislative act in 1739 established "a market in the parish of St. Philip, Charlestowne," calling for a public market to be open every day of the week except Sundays, at the place whereon a "new market house has been lately built." By 1744, the new beef market was in shabby condition, described as "only a low dirty looking brick market house for beef," and in 1760 the Commissioners of Markets erected a replacement. This "neat building, supported by brick arches, and surmounted by a belfry," was one of only three markets allowed under the 1786 ordinance regulating the public markets of the City of Charleston. 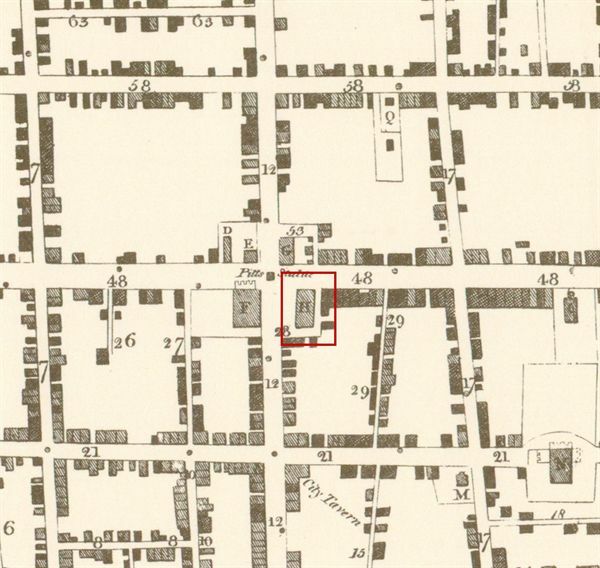 These were described as "the place established and laid out for a market in the original plan of the city and commonly known by the name of the Beef Market; the market established on the low water lot fronting Tradd Street, at which two markets all kinds of butchers meat, poultry, fruit, vegetables, and all other articles of provision, shall and may be sold. And the market on the low water lot fronting on Queen Street, for all kinds of fish." The beef market was destroyed in the fire of June 13, 1796, and not reopened afterward. Meat vendors were encouraged instead to use the market area given to the city by the Pinckney family in 1788. In 1800, City Council conveyed the Beef Market property to the First Bank of the United States. Gabriel Manigault (1758-1809), Charleston's "gentleman architect," designed the new branch bank. 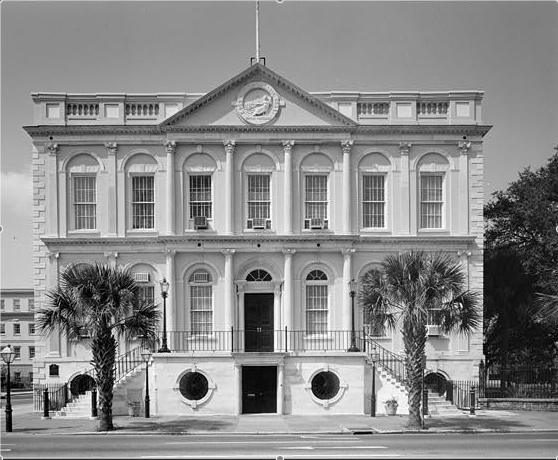 After the failure of the Bank of the United States, in 1818 the City of Charleston bought the land and building, in order to move municipal offices and Council Chambers out of the Exchange. Behind the new City Hall, a small park was laid out, on the northwest corner of which the Fireproof Building was erected in 1826. In the late nineteenth century, City Hall Park was redesigned and became a principal location for memorial statues and monuments. In 1881, the century-old statue of William Pitt was moved from the Orphan House courtyard to the renamed Washington Park. Behre, Robert. "Bricks and bones at City Hall." The Post and Courier, March 31, 2004. Behre, Robert. "City Hall reborn, restored, revived. Subtle changes preserve building's spirit." The Post and Courier, June 11, 2007. Behre, Robert. "City Hall renovation bares it all." The Post and Courier, February 27, 2005. Calhoun, Jeanne A., Elizabeth J. Reitz, Michael B. Trinkley, and Martha A. Zierden. Meat in Due Season: Preliminary Investigations of Marketing Practices in Colonial Charleston. The Charleston Museum Archaeological Contributions 9. Charleston, 1984. Columbian Herald, October 16, 1786. Zierden, Martha, and Elizabeth J. Reitz. Archaeology at City Hall: Charleston's Colonial Beef Market. Charleston: The Charleston Museum, 2005. Bishop Roberts and W. H. Toms, Ichnography of Charleston, South Carolina, 1739. 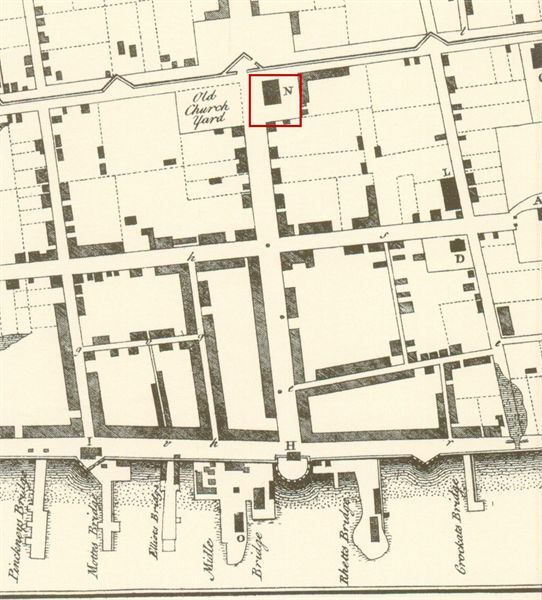 The New Market is marked "N" on the 1739 map of Charleston.